From time to time, the full screen view has driven MacBook owners bonkers — that’s because full-screen view restricted you to displaying a single application window. Sure, you could open multiple applications and put each in full-screen view, but many tasks (especially those that involved comparison or collaboration) required the constant use of ⌘+Tab to switch between windows. Power users simply had to resign themselves to using full-screen view with one application. Move your pointer over the Zoom/Full-Screen button in one of the desired application windows and click and hold. 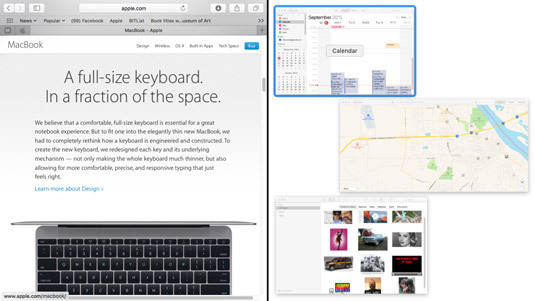 El Capitan switches to full-screen view as usual, but you’ll notice that the left half of the screen is highlighted in blue — this indicates the side of the screen that this application window will occupy. Application windows that have been minimized to the Dock can’t be used in Split View. You also can’t use application windows that are already set to full-screen view. Click on the desired application that should share the other half of the full-screen view. The available application windows (which are not currently minimized or in full-screen view) are shown as thumbnails — click a thumbnail, and the window expands to fill the other half of the Split View screen. Once your Split View screen has been set up, you can switch between the two applications by simply clicking on the desired window. If you need to resize one of the windows to make it larger, just move your pointer over the center line until it changes into a double-arrow icon, then click and drag the line to the desired spot. You can display the menu bar for the currently active window just like an application in traditional full-screen view — just move your pointer to the top of the screen. Display the application menu and choose the View → Exit Full Screen item. Press the Exit Full Screen shortcut ⌘+Control+F.